SANTIAGO – June 20, 2013 – Evilot, the first title from Chilean game developer Syrenaica is available today for PC and as a universal iOS app for iPhone and iPod touch, no longer exclusive to iPad. Combining the best elements of two popular genres, Evilot is a puzzle defense game where players command the forces of Count Dolfus, a retired semi-evil mastermind whose brooding Golden Years are being disturbed by an army of do-gooders bent on conquering his castle (and stealing all his loot). A free demo version is available on the iTunes App Store along with the full version for $0.99, while the Windows PC version is a mere $1.99. Sink your teeth into puzzle defense and download Evilot now! Accessible to even casual players, Evilot’s 50 levels are set up on a grid with the forces of Dolfus defending against baddies (err… goodies? ), who race down lanes toward mountains of hard-earned treasure. 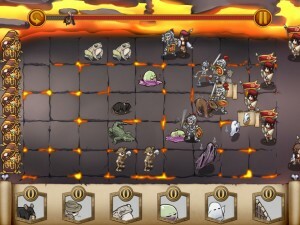 Gameplay goes beyond the traditional “set it and forget it” tower defense mechanic, adding a puzzle-based unit upgrade system. Place three of the same units together in a column or row and they combine to create a more powerful, leveled-up unit. Keep units tightly packed for more powerful upgrades, or spread them out for a weaker, but wider defensive spread. It’s a compelling twist on tower defense that is easy to play, yet difficult to master. Funded partially through Kickstarter, the title’s orchestral score sets a mood suitable for a Transylvanian invasion. Previously an iPad exclusive, Evilot is now available as a universal app on iPhone, iPod touch and iPad, as well as PC via the Desura platform. Visit http://www.syrenaica.com/ and http://www.evilot.com/ to learn more, then follow Syrenaica on Facebook and Twitter for the latest on Evilot. Check out the trailer on YouTube and find game assets in the press kit. Also, check out this sweet video of the orchestral performance of Evilot’s original soundtrack! Syrenaica is an independent global interactive entertainment software company founded and located in Santiago, Chile. Their mission is to create groundbreaking games through a culture of joy. Syrenaica develops and publishes interactive software globally for several platforms with emphasis on mobile & social networks.